These cylindrical magnets are actually special magnetic systems. 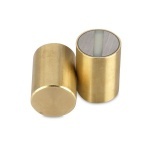 The magnet core or the two magnets are placed in a metal coating made of steel or brass. Thanks to this metal pot you can easily glue or stuck them. In addition to this, we offer you many mounting and fixing possibilities. 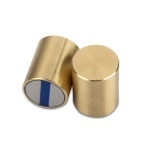 No matter if external thread or threaded hole you will find the perfect magnet for your project.